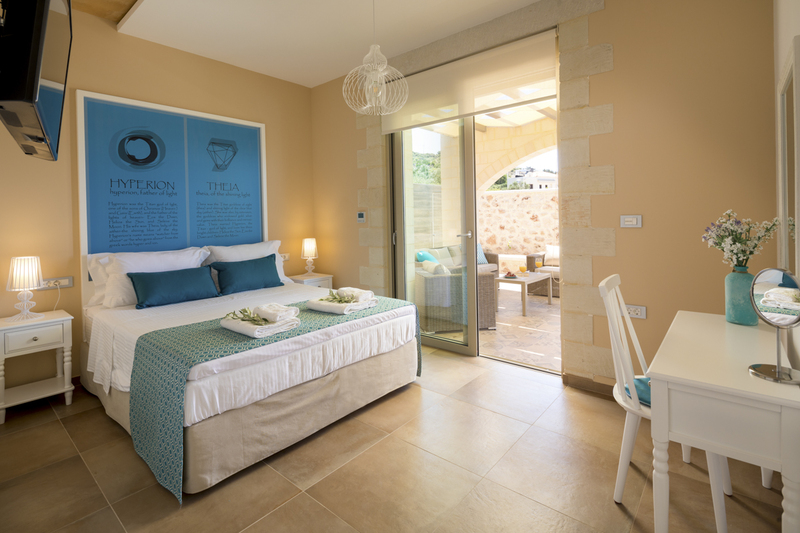 Villa Elif is a beautiful, open-plan villa, located in the charming, small village of Kokkino Chorio. 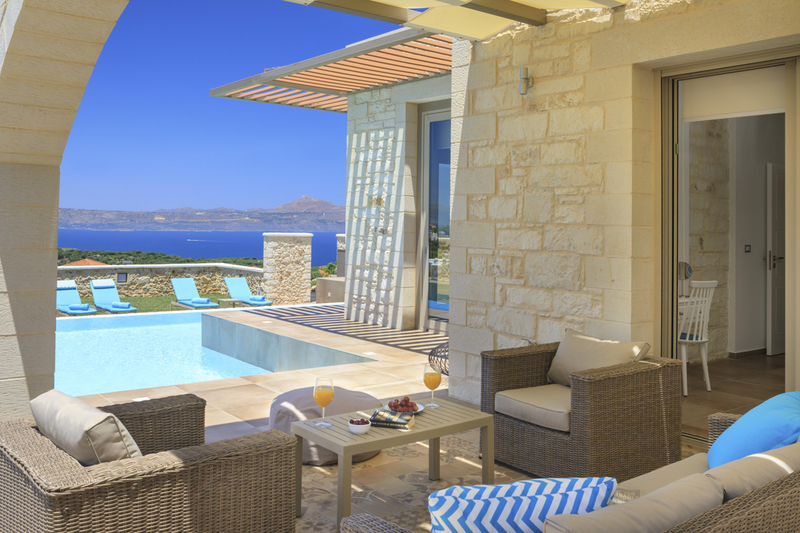 If you are looking to escape the hustle and bustle, to watch breath-taking sunsets each night and to soak in the Grecian sunshine from the privacy of your own terrace, then look no further! 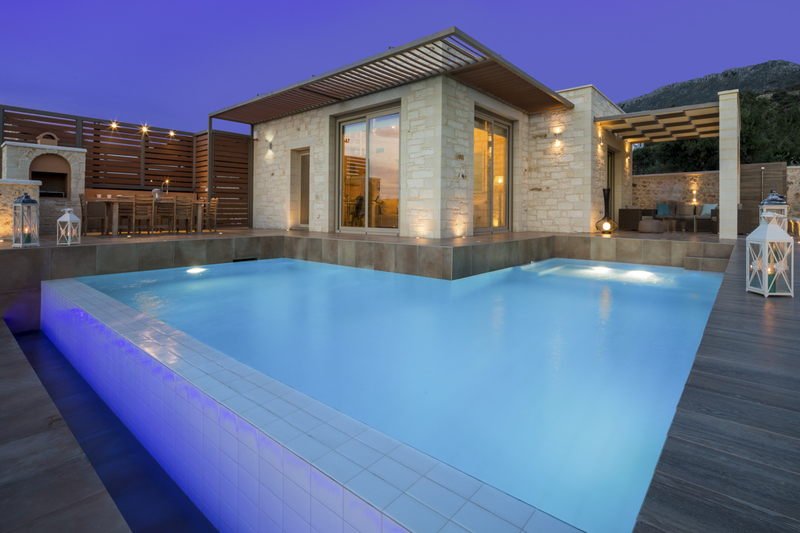 Sleeping six guests, this minimal, stone property offers the perfect location for exploring Crete’s stunning coastline and bustling towns! 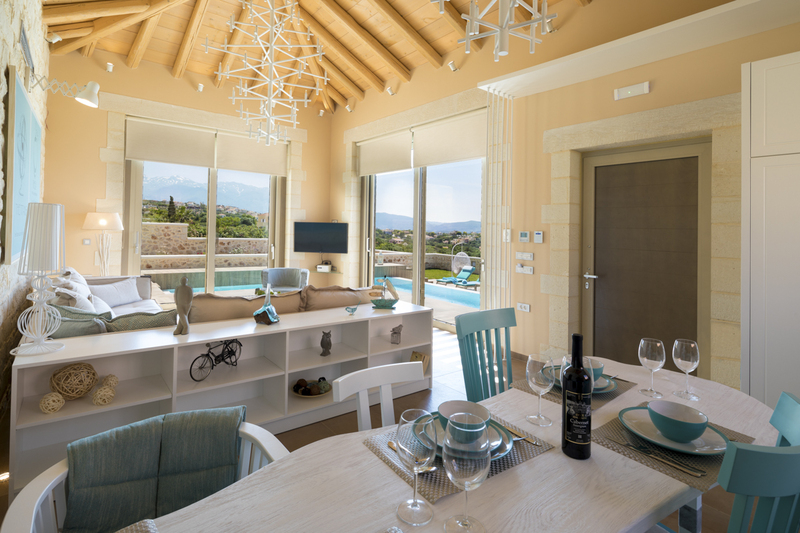 Arranged over one spacious floor, this villa is great for sociable groups that want to spend some time together. 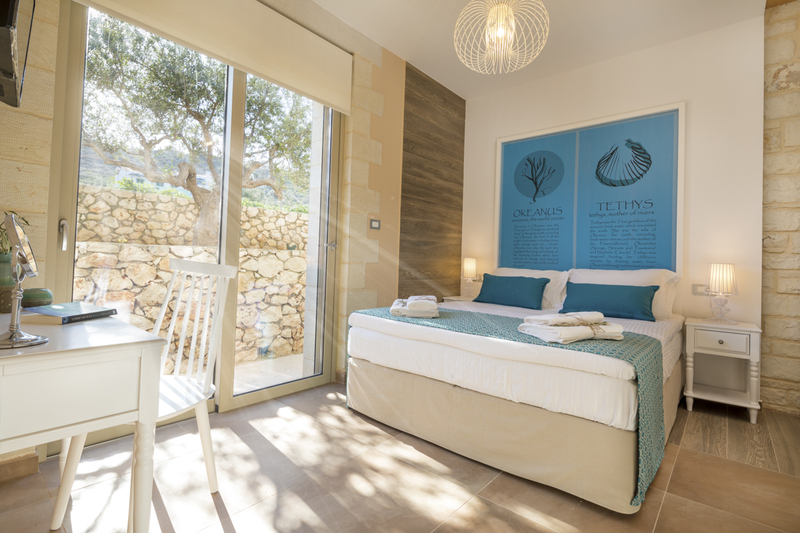 Each room is bright and airy, with picture frame windows offering constant glimpses of the beautiful surroundings. The kitchen, living and dining space is open-plan, with large doors leading out to the glamorous terrace, allowing the indoor and outdoor areas to become an extension of each other, forming on huge entertaining space! With wooden beams on the ceiling and exposed stone walls, there is a warm and welcoming atmosphere to this modern living space. A large L-shaped sofa takes pride of place in the centre of the room, perfect for everyone to come together, put their feet up and enjoy each other’s company. 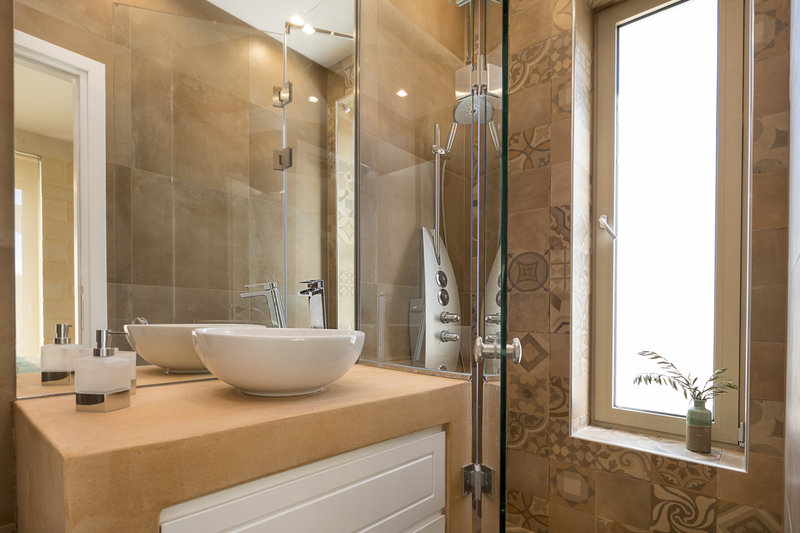 The two double bedrooms boast en-suite shower rooms, designed to meet your every comfort! 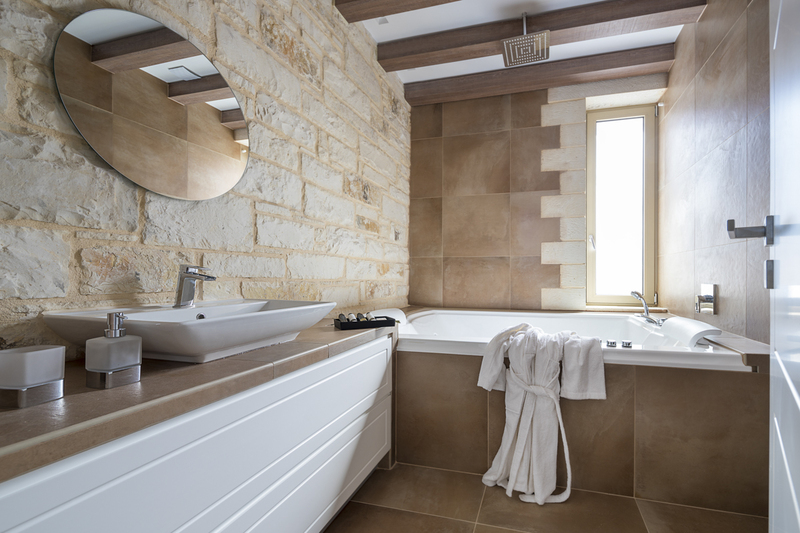 There is also a luxurious separate bathroom in the villa with a fabulous hydro-massage bathtub for two people, so make sure you pave out some time to relax in the bath! 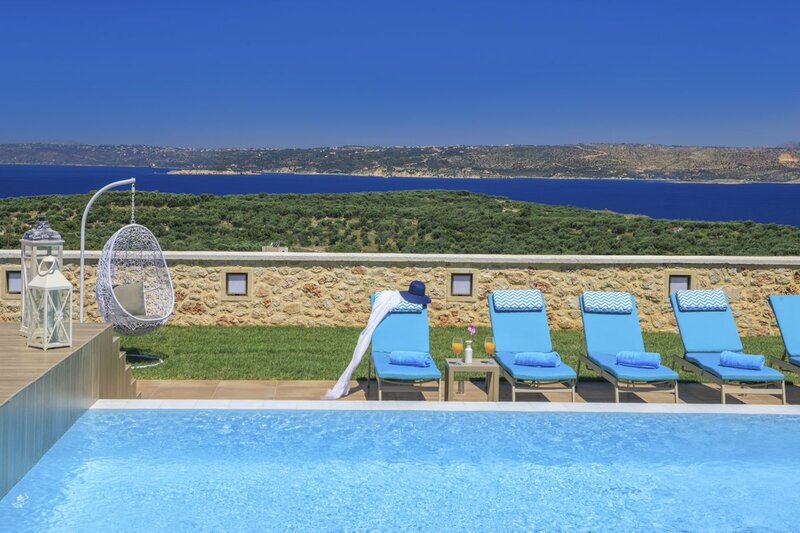 Out on the terrace, combining pleasant views of the mountains with the breath-taking, panoramic view of Souda bay and the olive groves, this romantic outlook leaves nothing to be desired. 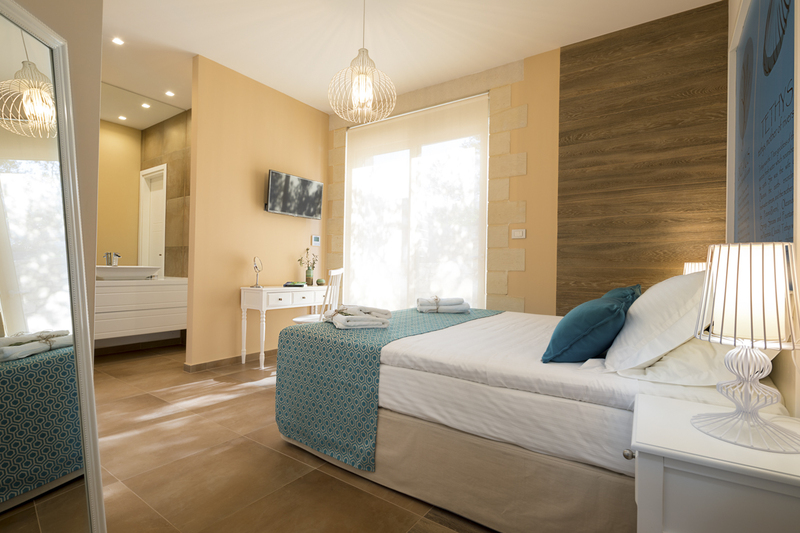 You can walk to the local tavernas within 20-minutes and enjoy the popular Cretan cuisine, or dine in at the villa, enjoying the stunning sunsets on the horizon. 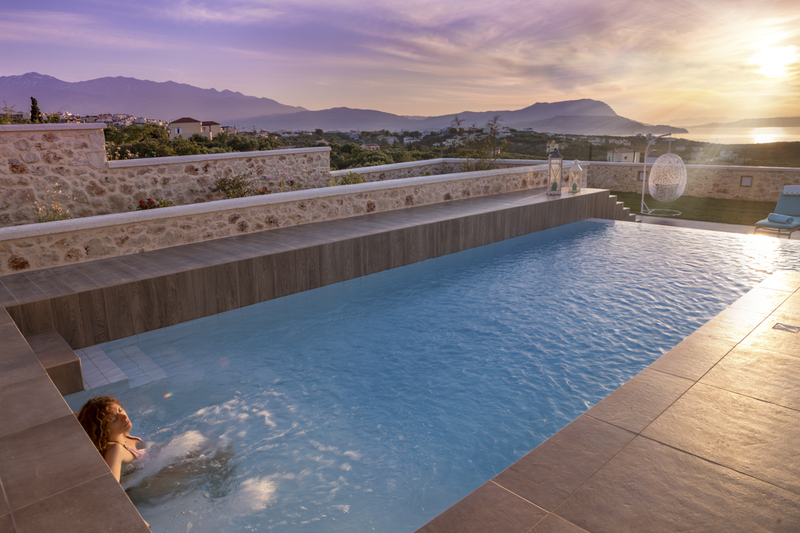 As you step outside, you can hop, skip and jump straight into the huge swimming pool, or sit and enjoy a glass of chilled wine in the hydro-massage sitting area! 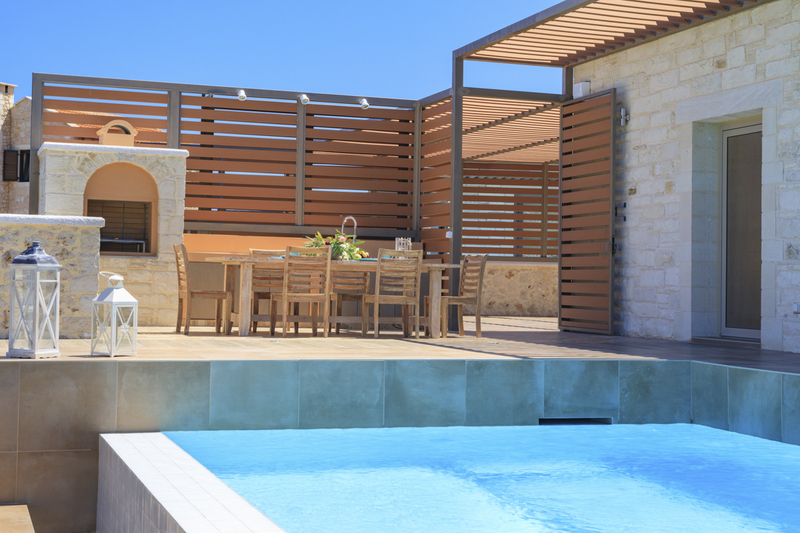 There is a barbecue and dining space as well as a laid-back outdoor lounge, providing every opportunity for you to immerse yourself in the natural sounds and atmosphere of the Cretan countryside. 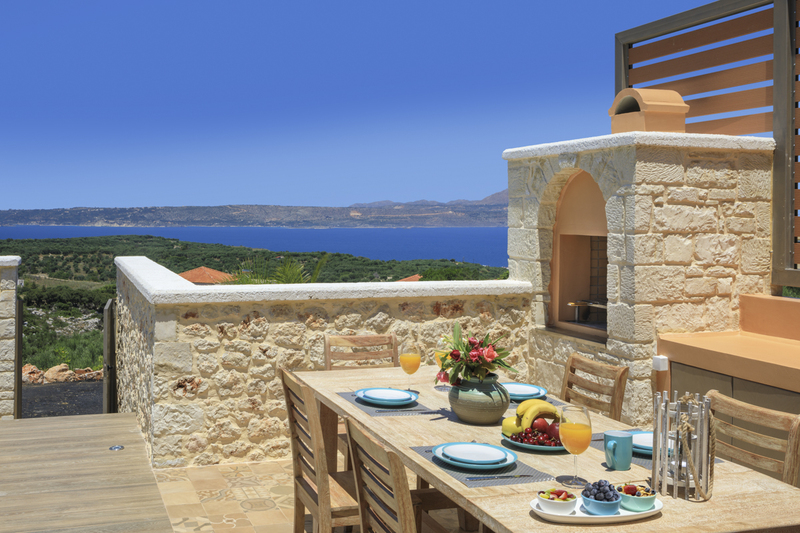 Villa Elif has a fabulous location in the small village of Kokkino Chorio, close to the larger village of Plaka where helpful amenities and picturesque pebbled beaches can be found. 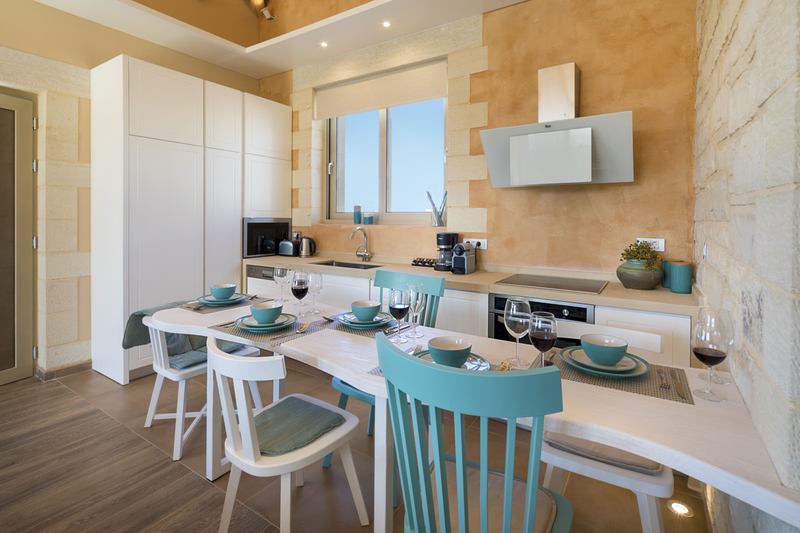 A little further along the coastline, just a 5-minute car journey away, is the resort of Almyrida which boasts a wider range of amenities as well as clean, family-friendly sandy beaches. Chania itself is just forty minutes away by car, with its picturesque Venetian harbour, it really is a must visit. 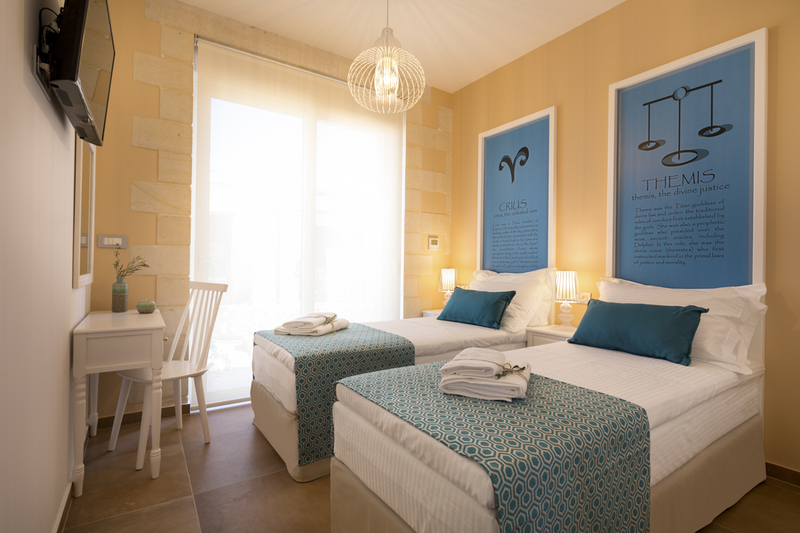 Chania International Airport is conveniently situated just forty-five minutes away. 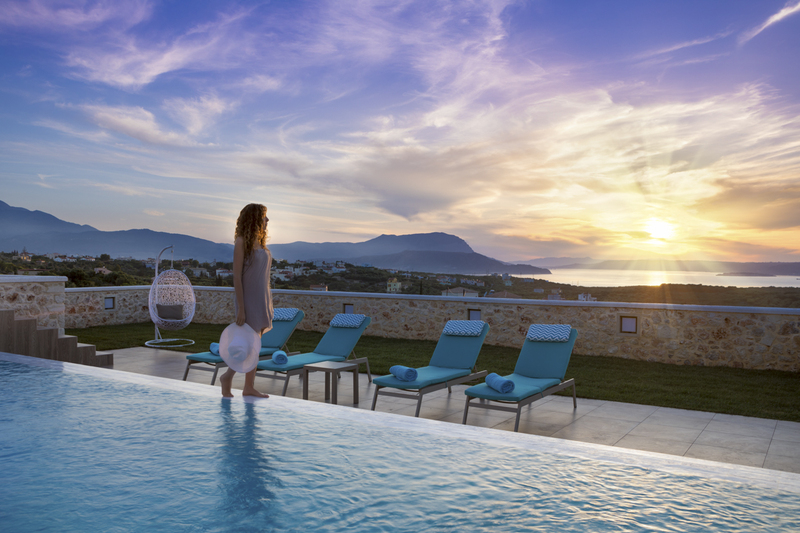 With gorges to be walked, ancient sites to be visited, time trodden villages to be discovered, and stunning sandy beaches to be lazed upon, this is the perfect Greek destination for holidaymakers of any age. Plus, food is in abundance. Look out for fresh seafood and traditional Greek moussaka. 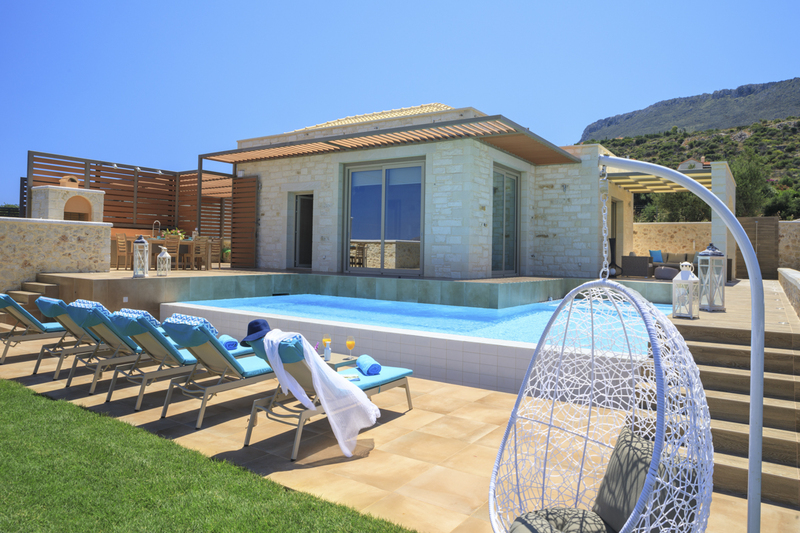 The villa is 30km from the beautiful city of Chania. There you’ll find a charming Venetian Harbour and old port, alongside narrow shopping streets and waterfront restaurants. From Chania, it’s a two-hour drive to the island's capital Heraklion where you can immerse yourself in ancient culture. The vibrant port city is best known for the Palace of Knossos. 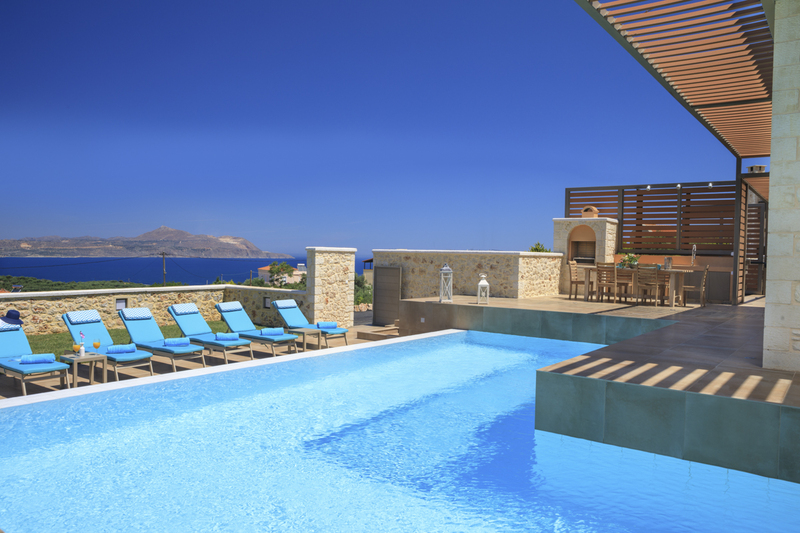 The archaeological site dates back thousands of years to the Minoan civilisation. Guarding the city’s Venetian port is the 16th-century Koules fortress. A drive around Heraklion will also bring you to traditional villages, Medieval castles, Byzantine monasteries and secluded coves.